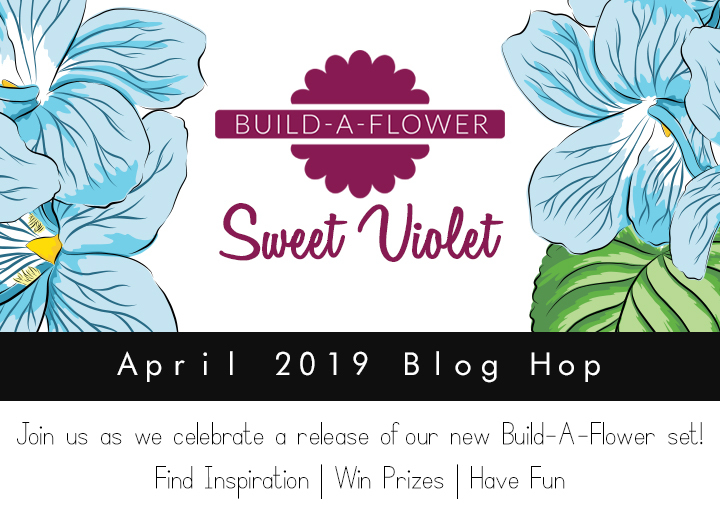 Hello everyone and welcome to the Altenew Build-A-Flower: Sweet Violet Release Blog Hop! If you came here from Caly Person’s blog, then you are on the right track. Otherwise, go back to Altenew Card Blog and start from there, as you won't want to miss anything! For today’s hop, I created a clean and simple monogram card combing the Build-A-Flower: Sweet Violet (also available as a bundle with ink) with Mega Alphabet M Die. I stamped my flower and leaves with Permanent Black Crisp Ink and used Altenew Spring and Winter Watercolour Brush Markers Sets to colour them in. Next I die cut the images using coordinating dies and added some green splatters. To finish the card I cut out the letter M out of green cardstock and adhered everything together. Next on the hop is Janette Kausen. Thank you for stopping by and enjoy the rest of the hop! Oh my, Aga! This is just simply gorgeous. What a wonderful way to use this new set. Beautiful! I love the monogram with the flower! Love the multiple colors you put in the flowers. Very similar to how they really appear. Great dimension and I love your color choices Aga! wonderful monogram card, Aga - love the colors you chose! Beautiful card!! Love the monogram. Your water coloring is beautiful and I love the texture of your flowers the way you’ve layered them. Lovely card. Love the dimensions. Totally different look! Your water coloring is stunning. I love the texture of your flowers the way you layered them with the leaves. Your lovely card POPS due to those layers and pretty colors. I love how you colored the Sweet Violet!! Wonderful card! What a great monogram! I love the CAS look! Beautiful match to make our own special stationary using these fabulous new Violets! Your card is beautiful; such pretty watercoloring! Violets are one of my favorite flowers! Your card with the letter would make a superb set of note cards for a gift. Just love your choices using the stamp set and so creative and inspiring. Love the rainbow-y effect of the flower and leaves. It is such a fun card. Love the water coloring you did. What a cute idea to add these beautiful flowers and leaves to a big alpha! How cool would this look on a journal cover? Thanks for a great idea! Gorgeous card! I love the colors you used! Awesome new B-A-F set! That's a great idea with a monogram! I never think to do that!! Adore this, love the large monogram! This is beautiful ! Love the colors! Lovely CAS design Aga. Love this new BAF set, thanks for the inspiration! Love this unique take on a monogram card. The violets looks super on it! How pretty! Love the dimension you gave your flowers. Beautiful watercoloring! I need some of those watercolor brush markers. Thanks so much for sharing. I love it! What a wonderful card!! 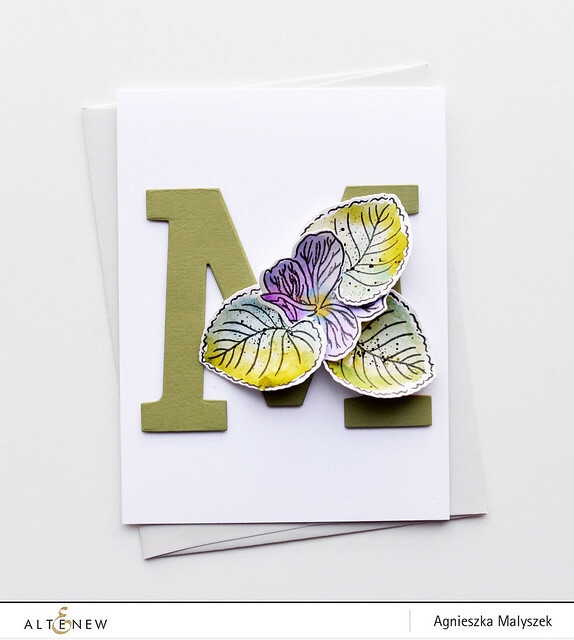 LOVE your watercoloured flowers and leaves, LOVE your bold & beautiful monogram design! Such a gorgeous clever card! 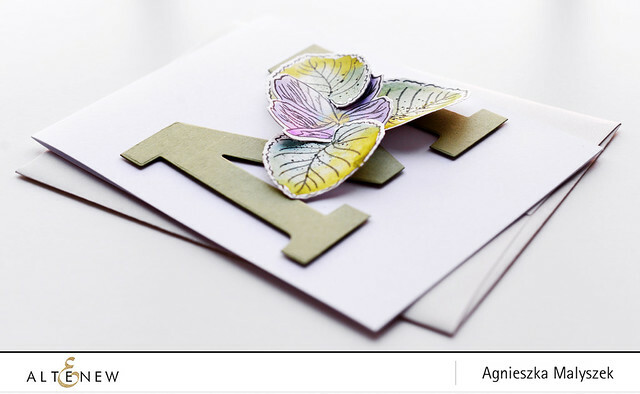 Love this simple way to individualise your card with these pretty little violets! Thanks so much for sharing and for your wonderful inspiration! Beautiful card. Love the blend of colors. Another winner. Thanks for the inspiration. Like the monogram. This builder is so versatile. Thanks. Love this card. The colouring is fantastic. And I love the CAS design. This is stunning!! I LOVE the colors on your leaves!! Those colors are amazing! Love the letter but the flowers are the charm! Lovely way to decorate a monogram - I love the soft washes of colour and how dimensional the bloom is. This is a very charming set. Beautiful clean,, simple card. I love the colors. Very unique and classy!! I love the design!! The way you arranged your flower and leaves looks very pretty. The pop of color against the white background is very appealing to me. Well done. So very beautiful and elegant card!